Another pesky infection is spreading, and it's turning the locals into crazed zombies. In this action-packed shooter, the fate of humanity rests in your hands. This is not a screen cap for Resident Evil 4. 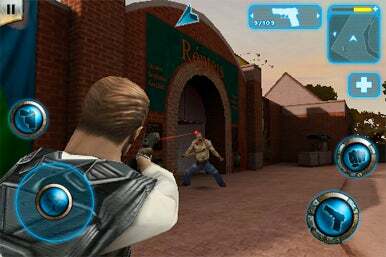 Zombie Infection by Gameloft is an over-the-shoulder shooter where you have to battle through twelve levels of zombie killing carnage. Like all of Gameloft's action titles, the game takes creative liberties with an established property. In this case, Zombie Infection is a B-movie version of Resident Evil 5. The game begins with Damien Sharpe and Alex Rayne aboard a helicopter flying over the South American jungle. Over the course of the game, you will switch between these characters, but initially you control Damien as he encounters zombies immediately after getting his boots on the ground. Control is via a virtual thumbstick for movement, and pointing on the screen aims your weapon. Occasionally, special-purpose buttons will appear to do things like small open crates or overcome obstacles. The locations of the controls are customizable via the options. Zombies are all mostly slow moving, but they can withstand quite a few shots depending upon your weapon. With the creepy sound effects and ominous soundtrack, there is some real drama each time you’re surprised by a pack of zombies. Right from the beginning, you’re wowed by the impressive cut-scenes and excellent voice acting. These cut-scenes will help to weave together an interesting back story giving you an experience above and beyond a simple shooter. Character control is excellent, and the immersive levels are varied and extremely detailed — they even look great pixel-doubled on an iPad. The different kinds of zombies you’ll encounter may be undead but they are still crafty and will challenge your shooting skills across the campaign mode. Complete the campaign, and you unlock a survival mode for even more zombie challenges. Zombie Infection is a superb shooter filled with plenty of challenge and fantastic visuals. You’ll be amazed by the level of detail and console-quality fit and finish. About the only thing missing is some sort of multiplayer mode and... royalties to Capcom. Zombie Infection is compatible with any iPhone, iPod touch or iPad with iPhone OS 2.2.1 or later.